Sfiso Ka-Mkame is a self-taught artist, of Zanzibari descent, who was born in Clermont on the outskirts of Durban in 1963. He continues to live in the township of his birth and commutes to his studio in Umkhumbane/Cato Manor each work day. He obtained sporadic art training through the 1980s achieving an important success in 1988 with the sale, to the South African National Gallery in Cape Town, of his ‘Letters to God’ drawing series. He was an active United Democratic Front member and his early work reflected the political conflict, daily struggle and hardships he witnessed. Ka-Mkame is featured in important South African art texts, such as Gavin Younge’s ‘Art of the South African Townships’ (1988) and Sue Williamson’s ‘Resistance Art in South Africa’ (1989). Ka-Mkame’s work is very decorative demonstrating nostalgia for African symbols; a quest that become more urgent and challenging for him after South Africa’s first democratic elections in 1994. With a group of like-minded artists in Durban, he began searching for symbols of an African identity beyond the confines of his own region and this is reflected in his paintings. He works on a number of pictures simultaneously building-up dense layers of colour with oil pastels starting with a yellow background and adding dark colours in sequence so that he can reveal and scratch patterns into his images. Ka-Mkame usually titles his work and this provides the viewer with the beginning of the story or narrative that has inspired his work. His use of bold colours is spectacular and celebratory, but a closer inspection reveals contrast in his compositions that are indicative of changed circumstances that have a hint of remorse. Nevertheless it is the African women resplendent in magnificently coloured and patterned gowns that currently dominant Ka-Mkame’s artwork, reminding art critic, Mario Pisarra, of the work of renowned Austrian artist, Gustav Klimt. Art Critic Hazel Friedman says “In such works as Sorrow Swallow Me Mkame’s use of red to denote the sky suggests his landscapes reside more in an emotional than naturalistic realm. The exuberantly patterned textiles and amulets worn by his female subjects convey a sense of yearning for an environment of miracles and mysticism. And the visual wealth of his pastel imagery attests to an unabashed passion for his medium.” (art southafrica vol 21 issue 02 2003). Ka-Mkame has participated in numerous group exhibitions between 1986 and 2004. 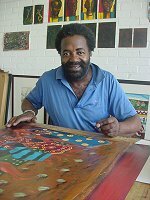 His first solo exhibition was held at the BAT Centre in Durban in 1996. Ka-Mkame’s work can be seen in numerous public collections in South Africa including the South African National Gallery in Cape Town and public galleries in Johannesburg, Durban and Pietermaritzburg. Corporate companies, such as the SASOL and Mobil Oil, have also added examples of his work to their art collections. Ka-Mkame is featured as one of the artists in the publication ‘10 years 100 artists: Art in a Democratic South Africa’ (2004).